Most of us spend a lot of time working out the interior schemes of our home and its rooms, but there is often another member of your family who needs a clean bed and some where to eat, as well as lots of love and attention. That is your pet. Whether it is a dog, cat, bird fish or a more exotic friend, we need to consider where we will make space not only in our lives but our home for them. Getting a dog or a cat, means we have to consider where it will live in relation to the other members of the family. From personal experience I know pets will try to take ownership of your favourite spots. They are cluey enough to know that is where you like to be and so they are often there, just waiting for you to turn up. Whether your pets live inside, outside or a combination of both, you need to consider their comfort and health, as well as the look and feel of your home. Pets need some boundaries and we can help decide these by making a permanent space for their beds, feeding bowls and litter. It also stops them feeling they have full run of your home. Interior pet beds are now as much a designer statement as they are comfortable and practical. Considering your décor when it comes to a bed that is in full view of the living areas, can give you a new decorating outlet. You may want to be a bit extravagant and buy a cane or timber pet bed - there are no rules to this, just what suits you, your pet and your budget. Cats like to find their own space away from the maddening crowds. They will sleep in the sunny spots and warmer areas of the house. If you do not want them on the furniture, make a bed from a large pillow or blanket that can be moved to suit their moods. 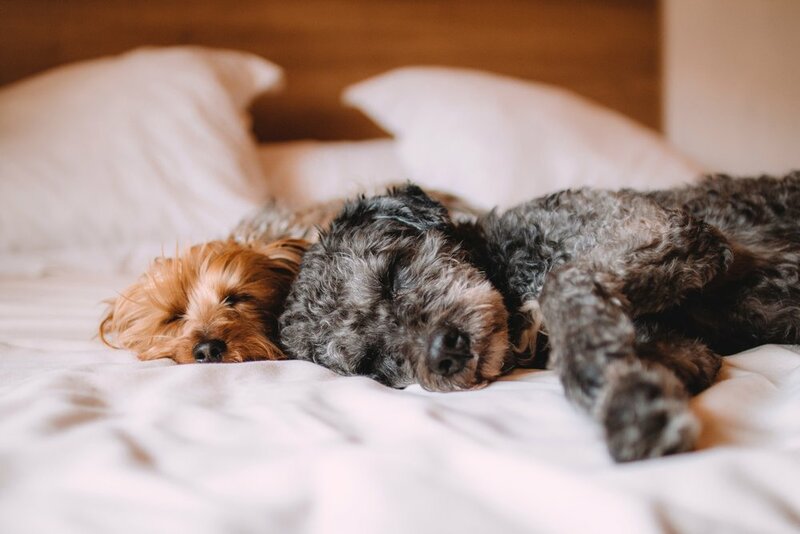 If your pet wants to sleep on the bed with you and will not take no for an answer, then consider bedding that will be pet friendly and also suit your room. Bed covers or Doonas that are easy to wash and do not show up the fur, are a wise move. We often have customers who consider the colour or style of bed linen for these very reasons. Remember embroidery and any detail in the fabric may be damaged by pet claws and feet, so going for a more simple bed cover design may be best. This also applies to the lounge area or your favourite chair. A loose cover or throw will protect the upholstery from damage and unwanted fur transferring from your pet to you or your guests. These are easy to remove and clean as you need. It also allows you to add a fresh layer to your living area. Look for throws or covers that are easy to wash, and are less likely to pull if caught. And if your pet decides to scratch or eat you favourite cushion or piece of furniture, don’t forget the invention of scratching posts. Pet bowls, collars and accessories are all items that can be bought to suit your décor. There are so many choices you will definitely be able to find products to suit your pets’ personality and your own family’s style. So fingers crossed, with some good management our favourite pieces will be safe from our little puppy, and they will feel happy and loved in their gorgeous new home.